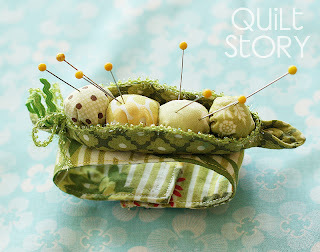 Good morning, our pea pod pin cushion tutorial is posting at Moda Bake Shop today, go check it out! Elaine from Dashasel sews made this awesome quilt! Look at the paper piecing little girl and fox! Love it! And the creative piecing, I think the modern looking shape is great. Plus I am really into red and blue again, so love the colorway. And the quilting...wow, this is all just great! Elaine is involved in a lot of swaps and fun projects over at her blog, be sure to check her out! For this week's Project Quilting, the challenge was "It's Where I Live". We were asked to interpret something about where we live. Further the colors of our quilt were based off of our street and city names and state. I realize some of these names sound a little wacky, but I got the list from here. As I culled my fabric, I realized that I didn't really have much pink! Thankfully I had a charm pack of A Walk in the Woods, which gave me a little bit of pink. I also had some Kona Cotton Pearl Pink for the background, so I figured I'd work with these. And of course, this is the one that I ultimately chose: I like that the "walking path" (curves of the NY beauty block) don't always perfectly match and I quilted to make the path feel a bit maze-like at times. It's funny because this quilt is not made in my normal, bright-loving color palette, but I really like how it came together. My sewing buddy, J's, love of these colors might have something to do with it :) I also usually make my PQ projects as wall hangings, but this one is going to be quilt meant for baby use. Of course, it will probably last baby girl the first month or so because it is a little on the small side...but since it is backed with Riley Blake's Sugar and Spice, it means she has to have it! Made in Milwaukee, Wisconsin and measures 30" square. I'm also now completely paper-pieced out! This is beautiful! I love the fabric choice and the paper pieced blocks. Those have always intimidated me. OH MY GOSH!!! that is SO beautiful!!! I have to tell you, I am NOT a fan of the NYB! (sorry, just not) BUT I LOVE THIS!!! B-E-A-utiful!! REALLY!! Love your Walk in the woods quilt!!! I love the "path" and your paper pieced little girl and the colors that you used. It was fun reading why you chose the fabrics and patterns that you used. And I came to your blog to tell you that I love your pea pod pin cushion. I voted for it on the Moda "Sliced" compitition. Great work!! I love quilts made with these colors but this pattern, WOW!! That is one of the things I love about quilting, the way you can play around with the blocks till something suits you. I love the choice it's just beautiful! As a beginner, I haven't tried paper piecing but hope to one day. Darling walk in the woods! I just saw your pincushion this afternoon and sent the link out to all my friends and the Crazy About Pincushions group. It's just adorable! Megan I am so sorry you didn't win. Your pincushion was really my favorite of them all. Hope you get a new machine soon. Love that quilt and the pea pod pin cushion is adorable.